I was still seated at my office desk yesterday at 5:05 p.m., the day before my vacation was to start, when my boss stepped into my office for the first time that day. By then I’d already shut down my computer. I was adding some files to an accordion folder before me, so I could throw it in my bike bag to take home. I’d be out of the office for over two weeks. I was pushing the limits of my vacation time and felt a little uncomfortable about it. I saw no choice but to take some work to finish from the road. Now my boss, it must be said, is surely the hardest working man in the housing biz. He is forever brimming with ideas, good ideas: strong, viable, fundable ideas, and he needs a bevy of workers to bring those ideas to life. As I was told by a former employee, “You’ll never work so hard as you will for him,” and over the past year I have come to understand what he meant. I’d crossed paths with my boss earlier in the day in the copy room, where he’d given me a quick update on a pressing project, saying that he’d need some material from me in the coming weeks but it could probably wait until my return. “Do you want to meet today to go over it?” I’d asked. But no, he hadn’t wanted to meet just then. Maybe later, or maybe it could wait until I got back. So when he walked into my office, I braced for the inevitable. “Any chance you have time for a meeting now?” he asked, resting his arms on the ledge of my cube. I felt a rush of panic. He’s a famous under-estimator of time; a request for a ten-minute meeting could easily turn into an hour or more. “Oh!” I said, casting about for a tactful answer. “Ummm, boy, not really,” I said, barely looking at him, my hands landing on the accordion folder before me as my silent defense. “Aaaah!” I said, trying to laugh off my mistake. My cheeks flushed with shame. I’d read him wrong. I’d been drawn out of my shell only to reveal that I couldn’t take a joke. “Huh. He’s self aware!” M said when I shared this encounter with him in the van as we set off on our family road trip this morning. Yes, he’d managed to make fun of himself. Unlike me. This humorless worker bee of a self is not the person I want to take on vacation. Really, who would want to go on vacation with me? Even I don’t want to go on vacation with me. I think the only way I can become the person I’d want to go on vacation with… is to go on vacation. It could take a couple of days before I get the hang of it. I am reminded of a long weekend getaway taken in June. 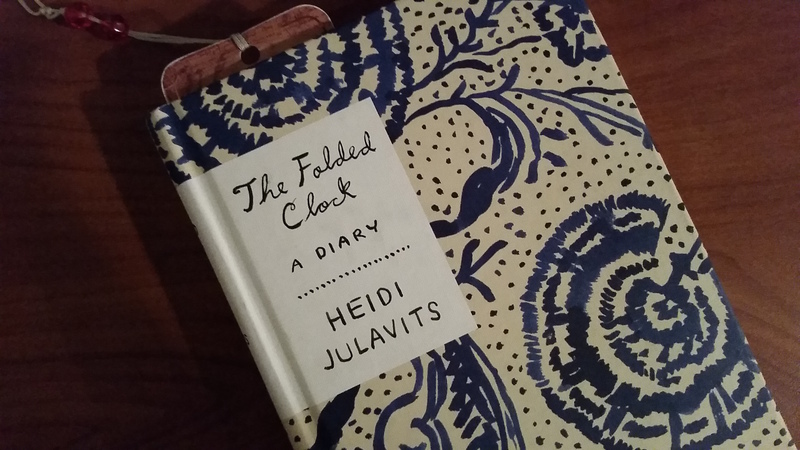 Two days into an opera binge in San Francisco with M, I found myself standing in the stacks of a bookstore, poking around the memoirs, picking up a book simply for its elaborate jacket: The Folded Clock. Curious, I opened it and started reading. And by the end of the first page I’d forgotten about the office, the kids, the homeless man slumped against the lamppost out front, the frumpish customer shuffling too close past me – all of it receded and all that remained was me with my head in a book, unconcerned about the world beyond. A few pages later I looked up and saw a comfortable chair nearby, and without further thought took the hardcover book with me, plunked down my bag and sat and continued to read. A while later I looked up again and saw M across the store, moving deeper into the history section. I could see he wasn’t looking for me. I felt a subtle shift just then, the ease of vacation time replacing home and work time. The delicious sensation of having nowhere in particular to be. Even after just two days I’d felt the difference, that the curmudgeon of a self I’d brought along on the trip was letting go a bit. So it turns out there is a different person I get to be with – to be – for a while when on vacation, and I couldn’t have inhabited nor enjoyed this person, this buried, easy self, without moving out of my ordinary orbit. I’m ready for that feeling again. This entry was posted in Travel - Beyond Berlin and tagged travel, vacation on July 30, 2015 by Jill M..
Lovely! I hope you have a great vacation.